The short answer, is to protect your brain. If you've ever considered going anywhere on your bike without your helmet, these stories may change your mind. To those who contributed, I say thanks. You may have saved someone's life. Alas, I am out of commission for 6-12 weeks, or 3 - 6 months, depending upon which doctor I listen to and how my body heals. I was on a bike ride this Sunday morning (55 miles of the Gold Coast) and at mile 1.7 another cyclist fell into me, obviously by accident, as her wheel caught the edge between the shoulder and main road. I was her cushion and I went down hard and fast. My head probably hit first and I likely would be dead if I had not been wearing my helmet. My helmet cracked big time and it clearly would have been my skull if....... I couldn't walk as I also fell on my hip. After the ambulance came and 7 hours in the emergency room, and after a catscan of my head and X-rays of my hip, my brain is in tact (thank goodness for my hard head), I broke my pelvis in two places and needed a plastic surgeon to close a pretty nasty gash on my shin. I'm in a wheelchair as I can't walk but I did get a walker which will allow me to hopefully walk to the bathroom, just at an incredibly slow pace. The broken pelvis bones are similar to broken ribs in that they don't need surgery, just a lot of time to rest and keep them somewhat immobile. Sooooo, anyway, I will not be playing tennis or golf or riding my bike for the rest of July and August. And since I drive a stick shift, driving will be a problem . I'm hoping for some September activities. Next week I was supposed to go on a weeklong bike ride called the Bon-Ton Roulet, where several friends and I were driving to Cortland NY and biking 300-500 miles around the Finger Lakes. Not happening. My spirits are good as I'm intimately in touch with how it really could have been so much worse. While waiting in the ER for the plastic surgeon, a 23 year old girl came in also from a bike accident. The plastic surgeon said she has no bottom lip from her fall. I don't know if she had on her helmet?? 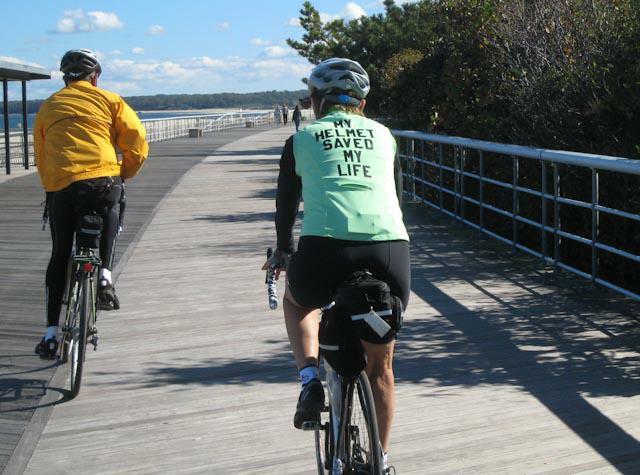 I have to confess, there were times that if I were biking on a bike path, like the Jones Beach run or Bethpage State Park, where there are no cars, I have occasionally taken off my helmet, thinking that cars were the main danger. Well, I won't bike out of my driveway without a helmet going forward. No car was involved in this accident and I really have my helmet to thank for saving my life. I'm also attaching a picture of a shirt I had made up (By the way, that's you, trail-boss next to me in the photo). I was once riding in a closely spaced pace line when I noticed the rider just forward of me attempt to aim her bicycle more toward the road, on her left, which involved moving over a segment that was a sudden jump of 1 inch. I immediately realized that her wheel angle was too gentle and, as I expected, the road not only stopped her from making the leap, but aimed her wheel in such a manner that she crashed, right in front of me. We were all traveling at a good speed so there was a lot of forward momentum in her fall. This caused her and her bike to spin clockwise while on the ground. With her head entering my front wheel's line what was my choice? I didn't have enough time to jump over her so it was either to go over her neck or chance the higher elevation of her helmet; I chose the latter. Amazingly it worked and, more, I didn't crash which surprised the hell out of me. In fact, I was so ready to go down that it felt odd, even unfamiliar, to NOT have crashed. Her helmet had a major crack running almost its full length...and she didn't even know I had ridden over it! She, being the trooper she is, wanted to get up and ride right away, before seeing the damage to her helmet. I suggested she sit down and wait at least 5 minutes while she examines herself and we do the same for her bike. Her bike was OK but she noticed that she had several puncture wounds in her elbow and knees. During her self examination her enthusiasm waned as a psychologically based sense of illness started taking over. We called an ambulance and arranged bike transport for her. The helmet worked as it was supposed to. Oh, she's a doctor but in the "heat of battle" was still capable of not realizing that, after any accident, take 5 minutes to examine thing and then make a decision to continue riding...or not. A bee was buzzing my face on Wolf Hill Rd. way back in the 80's b4 I wore a helmet. I kept swatting at it rather than stop riding. I flipped over my handlebars w/o a helmet. Lucky me, as I was able to land on my rear. But it took 2 months to heal from the tailbone injury. It made me realize I needed the head gear. Along came Trail Boss, and I learned I also needed gloves and a rearview mirror. I've been riding nearly every nice day for 39 years. If you ride enough, stuff happens -- BE PREPARED!!! Many years ago, after our bike group had started wearing helmets (yes, we were helmet-free in the good old days), I learned the value of head protection. On a ride in Oakdale, I was riding behind a woman in our group. When you ride behind someone, you can't see the entire road ahead. There was a 2-by-4 in the road that neither of us saw. I couldn't see it because she was in front of me. I don't know why she didn't see it (this was before the days of electronic distraction). She hit it, and in an instant her helmeted head hit the asphalt. She felt to her left, slightly into the traffic lane, but fortunately, no cars were approaching. As the other bikers caught up, we moved her and her bike onto the grass. She was totally conscious, although understandably shaken. Her helmet was cracked in 3 places. That could have been her skull, not to mention the internal damage that could have occurred. The helmet did its job so well, and she was able to get back on the bike and finish the ride.